When I looked at the 4Duino-24 architecture there was something that rang a bell in my head. 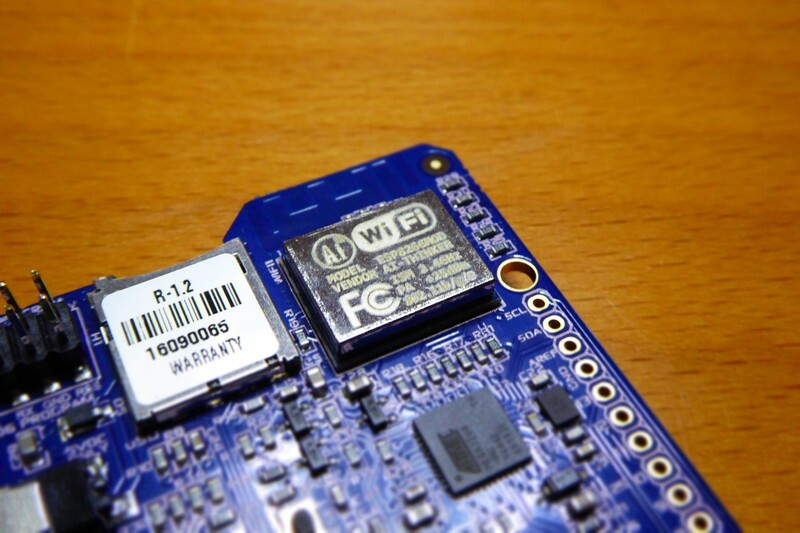 Well, here we have again en ESP8266 being used as a mere serial to wifi bridge. 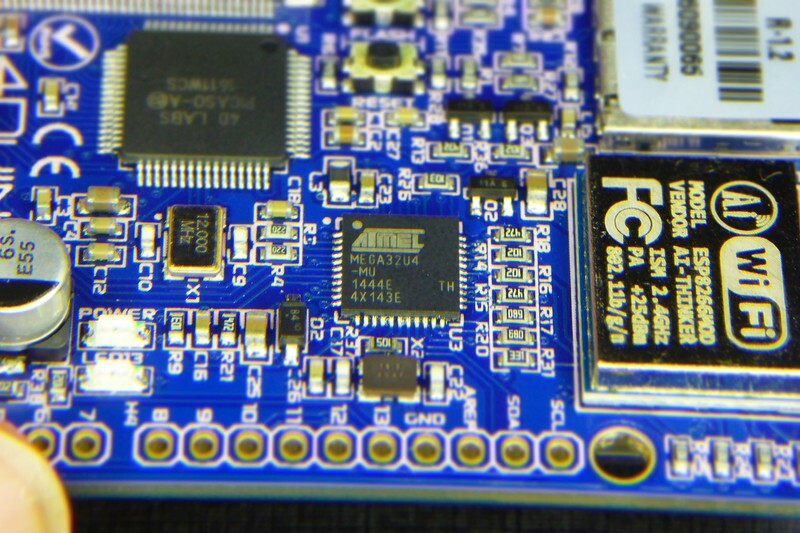 The central microcontroller of the board is the Atmel ATmega32u4, the same one the Arduino Leonardo has. It’s a good 8-bit controller but nothing compared to the ESP8266 that sits a few milimeters away. Well, there are all sorts of ways to look at it. 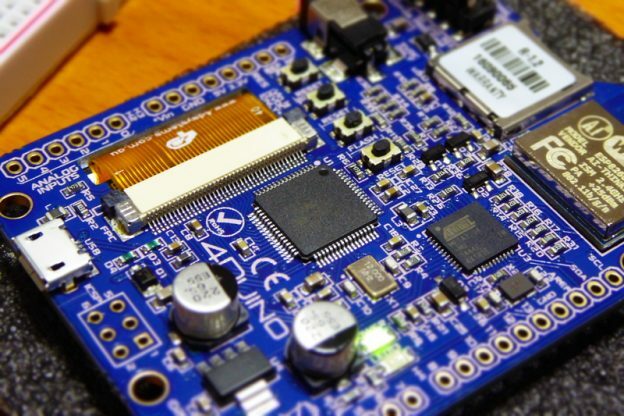 The ESP8266 is the most powerful processor, the Picaso is second and the ATmega32U4 is the least. But the ESP8266 has limited I/O, so using it as the main processor is not ‘optimal’ as it restricts users in the I/O they can add to the configuration. The way it is designed each processor is being used in the best way to play up eachs strengths. The ESP8266 for its ability to do WiFi, Picaso for its graphics capabilities and the ATmega32U4 for its rich hardware connectivity and available code libraries. And it makes perfect sense. Needless to say the Arduino community is the biggest by far so placing the ATmega32u4 as the main controller makes it easier for a lot more people to use the board. 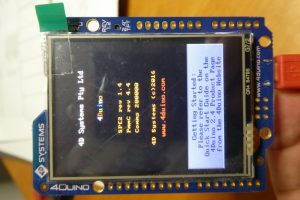 The ATmega32u4 has plenty of GPIOs, digital and analog, to plug your sensors and two hardware serial ports, one of them used for the USB interface and the other one to communicate with the Picaso controller that drives the display. 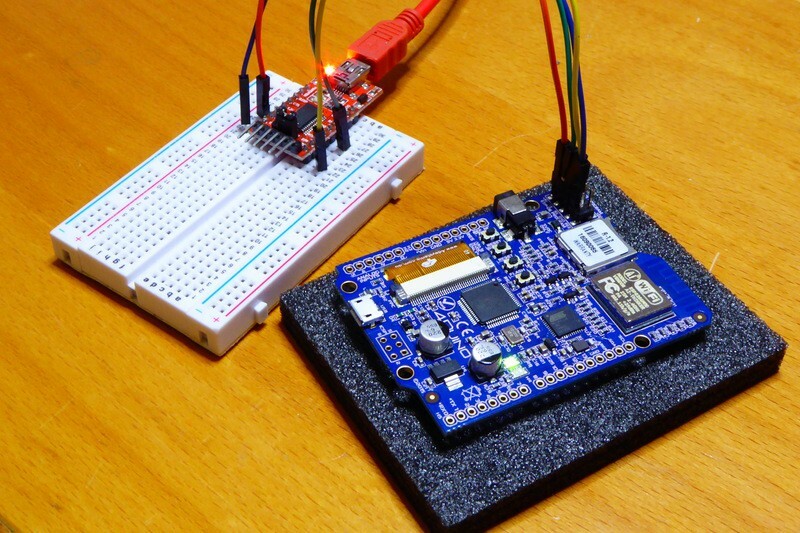 Still… the ESP8266 is way more powerful. And you know what? 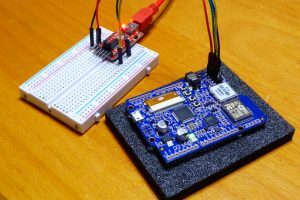 A lot of the “available code libraries” for Arduino can be ported “as is” to the ESP8266 platorm using the Arduino Core for ESP8266 project. 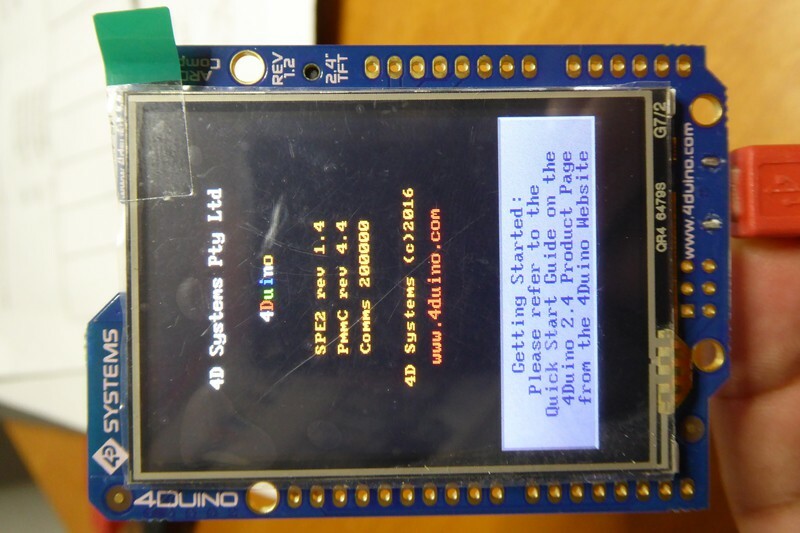 Including 4DSystems Picaso Serial Library for Arduino. Also, you might want to check the 4D Workshop4 IDE that integrates code editing and tools to design the graphical interface of your application. It’s a Windows only application (me sad) and freeware except for the PRO version (trial-ware) that integrates a code-less development environment named ViSi-Genie. If you have been reading me you would know I’m a PlatformIO fan. It freed me from the Arduino IDE and provides a whole lot of goodies and support for tons of boards and frameworks aside from Arduino ones. It’s a truly one-tool-drives-them-all!! So my first thing was to add 4Duino support to PlatformIO. 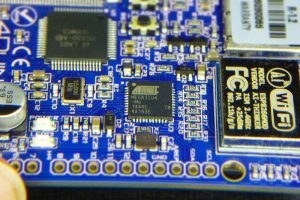 It basically comprises two steps: adding the required definitions and code the same way the Arduino IDE would do and adding an entry for the board in the Atmel AVR package for PlatformIO to know about the board. These two differences mean changes in the bootloader, the coreUSB libraries and the pin definitions file. So 4D Systems maintains a board description file for the Arduino IDE board manager that automates the process of downloading and installing custom files for the 4Duino-4D board. We will have to do the same. The Picaso microcontroller can be controlled through serial commands and the Picaso Serial Library encapsulates these commands in a more human-friendly API. But they are just serial data flowing up and down, so it can be easily forwarded to another destination. That’s just what we need. Easy, no? All the encoding and decoding will be done somewhere else (in the ESP8266) so the ATmega32u4 does not need to know what it is forwarding. There is one caveat, thou. 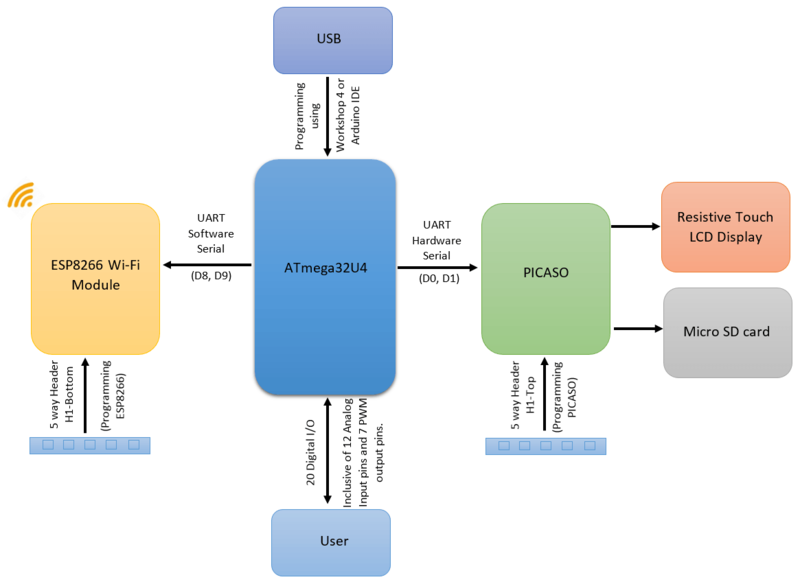 I said the ATmega32u4 has two hardware serial ports, but one is already used by the USB connection, the other goes to the Picaso board and we need a third one the ESP8266. This third one will have to be a SoftwareSerial port. SoftwareSerial allows you to use almost any 2 pins as TX/RX, but since the protocol is implemented in code it’s slower than its Hardware counterpart. At 57600 bauds it is reliable, but that’s almost 4 times slower than the 200kbauds of the connection between the atmega32u4 and the Picaso. Also, if we don’t want to lose the possibilities of the plethora of GPIOs of the ATmega32u4 (and shields) we should put a mechanism in place to query them from the ESP8266. The good thing about it is that we already have one. The Picaso Serial Library. All the messages for the Picaso controller start with a 2 bytes (a word) command identifier. The first of those bytes can be 0x00, 0xFF or 0xFE. When the Picaso receives a valid message it responds with an acknowledge (0x06), an encoded response (like touch screen status or coordinates) or some kind of error. So what if I implement my own commands and monitor the messages from the ESP8266 to the Picaso controller intercepting those that start with my own starting code? Here you have a first version of the bridge code that runs on the ATmega32u4, forwarding messages between the ESP8266 and the Picaso controller and intercepting those that start with a 0xF0. As an example the only custom command implemented allows the ESP8266 to control the builtin LED attached to GPIO 13 of the Atmel IC. This section might look a bit empty but, actually, there is nothing to say. It just compiles and works without modifications. Now on the ESP8266 side I just have to copy the Display_print.ino example and run it. If I want to use the custom command I implemented in the ATmega32u4 side I could just send it manually but extending the Picaso Serial Library is a more elegant option. Simple and elegant. I like it! Only one thing. For this wrapper library to work I had to do a minor change to the Picaso Serial Library. I had to change the private methods to protected, so I could use them from the inherited class. Flash it and enjoy. Two things about flashing the ESP-06 module in the 4Duino-24. First remember that even thou the ESP8266 is a 3V3 IC the programming connector brings out the 5V line, so connect it to a 5V supply. Second: once flashed disconnect the RX line, I noticed that it runs unbearably slow if connected. There is a lot of work to do but the foundations are there. You can use the 4Duino-24 the original way or you can do it upside down. 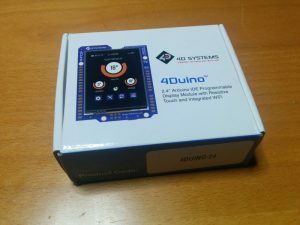 4Duino-24 upside down by Tinkerman is licensed under a Creative Commons Attribution-ShareAlike 4.0 International License.